Sometimes we like to try new things and set new goals. And, sometimes our goals feel out of reach, especially when others are trying their hardest to bring us down. When this happens, we often just need a little inspiration. When Marge and Lola, two chickens, enter a talent contest to win tickets to see “Elvis Poultry” live in concert, they have to dig deep to overcome a flock of taunting ducks so that they can find the talent they posses within themselves. When times get tough, Marge and Lola find inspiration in the cows who jump over the moon! Do they win the talent contest? No story spoiling here, sorry! What I will tell you though, is that author Tammi Sauer has delivered an inspiring message of perseverance and courage — often the talent we behold is the talent of being ourselves. Tammi’s message has been so wonderfully wrapped in a lively tail shaking, feather ruffling way, every child and parent will delight in its charm. Not to mention the deliciously rich and vibrant acrylic and ink with Adobe Photoshop illustrations by Dan Santant. His talent and wit are the perfect addition to this charismatic book. 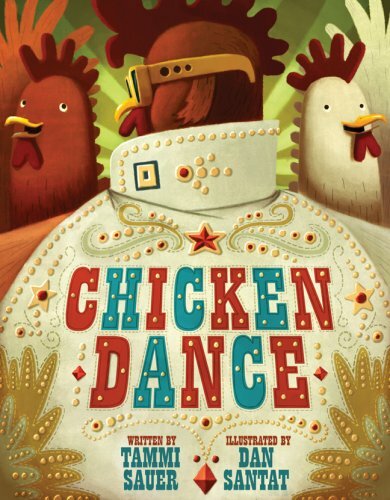 I’m just going to finish with one of Elvis Poultry’s hits: “I Don’t Crow if the Sun Don’t Shine”, and this book makes the sun shine, so I am crowing with happiness! Tammi and Dan, thank you … thank you very much! About the Author: Tammi Sauer is the author of the best-selling Cowboy Camp (Sterling, 2005), which was a 2006 finalist for the Oklahoma Book Award; selected for Nevada Young Readers’ Award Reading List for 2007; and selected by the Oklahoma Center for the Book as the premier Oklahoman title at the 2007 National Book Festival. She is an active blogger (www.tammisauer.com) and highly involved in the children’s writer community. Tammi graduated from Kansas State University with a BA in Elementary Education and has worked as a teacher and library media specialist. About the Illustrator: Dan Santat is both author and illustrator of The Guild of Geniuses (Arthur A Levine Books, 2004).which was a Society of Illustrators Original Art Show Selection and won the Los Angeles Society of Illustrators Bronze Medal for Book Illustration. In addition, Dan illustrated Rhea Perlman’s Otto Undercover series (Katherine Tegan Books/HarperCollins) and The Secret Life of Walter Kitty, written by Barbara Jean Hicks (Knopf Books for Young Readers, 2007). Find out more at www.dantat.com. As parents, we often need to be creative in the way we encourage and discourage certain activities that our children wish to partake in. Never wanting to squash their ambitions, but always needing to keep them safe and out of harms way. As we learn from the mother hen in Egg Drop, when young ears are eager, a little bit of jaw-dropping creativity can go a long way. “We tried to put the egg back together again, but nothing really worked and shells don’t heal. Mini Grey’s Egg Drop is one of the nuttiest picture books I have ever read that still manages to send its message home: err on the side of caution. 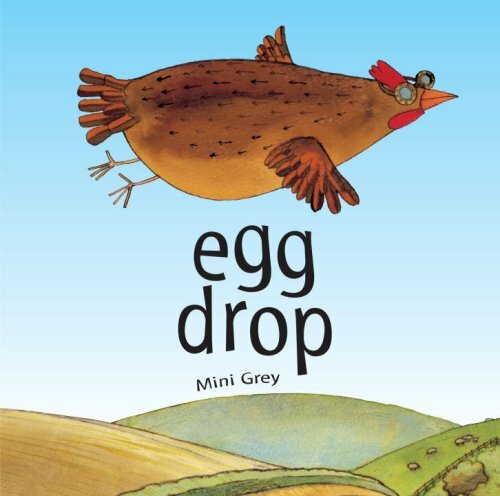 It takes talent to be an author and illustrator, but with Egg Drop the real talent lies in Mini’s talent to be so shocking and still have the reader being able to see the sunny side up. A truly original tale! About the Author-Artist: Mini Grey was born in a Mini Cooper car in a parking lot in Wales, thus her name, Mini. She is the brilliant young author-artist of Traction Man Is Here!, which won the Boston Globe–Horn Book Award; its sequel, Traction Man Meets TurboDog, which was the recipient of many starred reviews; and The Adventures of the Dish and the Spoon, a Kate Greenaway Medal winner. Tell us about the books that you like to use to teach children about ambition or over ambition? Leave us a comment below.